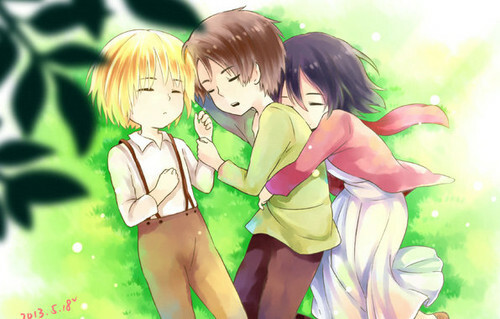 Eren, Mikasa, and Armin. . Wallpaper and background images in the অ্যাটাক অন তিতান club tagged: photo attack on titan shingeki no kyojin fan art eren jaeger mikasa ackerman armin arlert. This অ্যাটাক অন তিতান fan art contains নকল মানুষের, কমিক বই, কমিকস, and কার্টুন.